I know what you’re thinking… ughhhh NOT another wood look!! This one is different I promise. Woodlines is inspired by plywood, not the face, but the edge. So why is the edge interesting? When you look at the edge of plywood, you notice how there is a subtle tonal variation to the edge. That is due to the wood grains of the thin layers running opposite of one another. This edge variation can change quite a bit depending on the wood species and Woodlines reflects this. Natural poplar (common grade) has a bleached blonde aesthetic with gray moments. How is this depicted in Woodlines? Those dark moments in the graining, come across as little dashes which are visible in the images on the left and right. 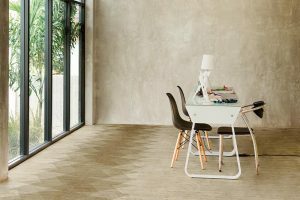 Woodlines takes the plywood aesthetic to the next level by overlapping a dark (faux) stain on the ends of the 9″x36″ planks (see image on right). I love this look! It allows you to create some interesting breaks or paths within the field tile. Have a project where you want the warmth of wood in a contemporary aesthetic, but don’t necessarily want a plain sawn plank? Well, Woodlines could fill this niche. It has a great range of plank sizes, as well as some cool décor and mosaics (see all images above). I especially love the irregular polygon in the left image… something different (for those who are tired of hexagons). One other fun fact, this collection has a rhombus (diamond) shape that can be used to create an arrow pattern or a cube shape. Size: 6″x36″, 9″x36″, 18″x36″, 6″ Diamond, 6″x13″ Chevron, 6″x32″ Chevron (left and right), 3D Mosaics and 3″x3″ Mosaics. Please see website and cutsheet for size and design availability. 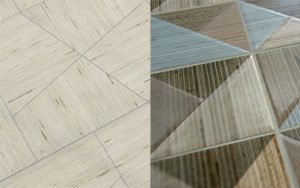 View the WOODLINES collection or request a sample. Say you want to use Woodlines for your project, but you’re not sure what complements it and won’t detract from the unique characteristics of Woodlines. I recommend Bedrock because of its great minimalist aesthetic and color palette. The soft, wide linear flow of Bedrock balances the compact, defined linear movement of Woodlines. The warmer hues of Cream, Beige and Brown would complement Woodlines Birch, Pine, Poplar and Shorea nicely. 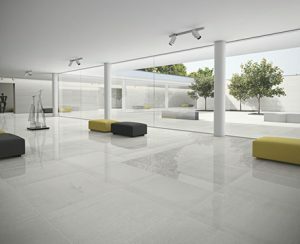 Bedrock would work great in any application where you want to balance out a tile with heavy movement or bold patterns. Bedrock also works well independently in your design. The matte and polished finishes allow you to play with sheen contrasting, and the variety of sizes allows you to create interesting monochromatic patterns. This collection is a great option if you’re in need of a minimalist aesthetic. Size: 6″x24″, 6″x48″, 12″x12″, 12″x24″, 12″x48″, 18″x18″, 24″x24″, 24″x48″, 36″x36″, 2″x2″ Mosaic and Mixed Linear Mosaics | Sizes are not available in every color and finish. Please contact your sales representative for availability.